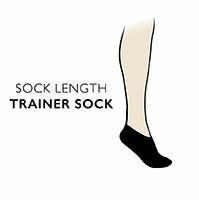 A low ankle liner sock that is anatomically designed to benefit golfers, Falke Ergonomic Cushioned Golf Trainer Socks absorb, relieve and protect throughout your round, combatting fatigue and supporting your feet – and your game! The socks are shaped to be left/right specific, placing protective cushioned pads at the toe area, heels and Achilles, and even create a stabilising effect, helping your golfing stance. Cotton air channels woven into the socks cool and filter humidity away from your feet, keeping them drier and healthier.